Words can’t describe how excited I am to be writing a post for seriouslyshallow.co.uk! I deliberated for a little while over my topic and then it hit me, do a skincare routine! For many years now I have suffered with really bad dry skin on my cheeks, forehead and around my mouth, but my nose and chin area is where I suffer with oiliness and spots. I have never understand how one part of your face can be so different to another and up until last year, how to keep it all under control. I tried all sorts of different remedies to dry out my spots like putting toothpaste on them or putting Sudacrem on them… they didn’t work. Then I tried different face washes and exfoliants ranging from Dermalogica, Clinique, and Elizabeth Arden. Still I was suffering with dryness and spots. Nothing was working and I was getting so frustrated with everything that I took a break from makeup for a while…. And again that solved nothing. 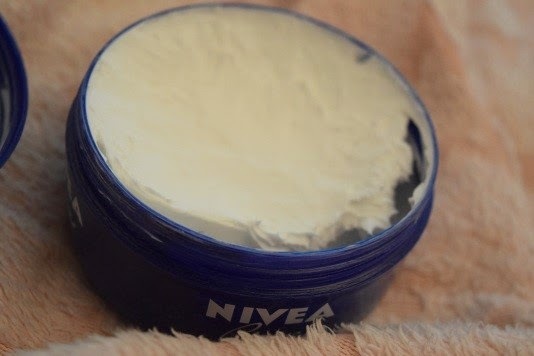 I was wandering through Boots with my mum one day and I saw that Nivea face wash and exfoliant was on buy one get one half price, and then I remembered seeing an article on the internet about Nivea VS Crème De La Mer and Nivea had come up trumps. I suggested going halves with my mum and without sounding corny… we have never looked back! 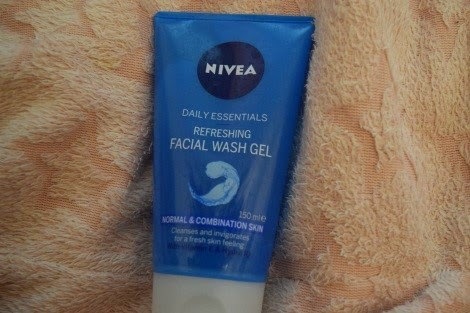 This face wash comes out in a gel like consistency (really like shower gel) but lathers up pretty well. I just take a teaspoon amount on my fingers, add a drop of water, rub my hands together and then rub all over a damp face. It removes all impurities and makeup (even night out makeup!) and leaves the skin feeling refreshed afterwards. It contains Vitamin E & Hydra IQ which leaves your skin feeling enriched with moisture. The packaging is pretty simple and minimal but I wouldn’t expect anything else with it being so affordable. I do like that you can see how much product is left though! The exfoliant feels very much like the gel but with little exfoliating balls in it. I love a good scrub to use 3 times a week and I love to feel it removing all the excess skin, it just makes me feel so much cleaner and like it’s actually doing something. 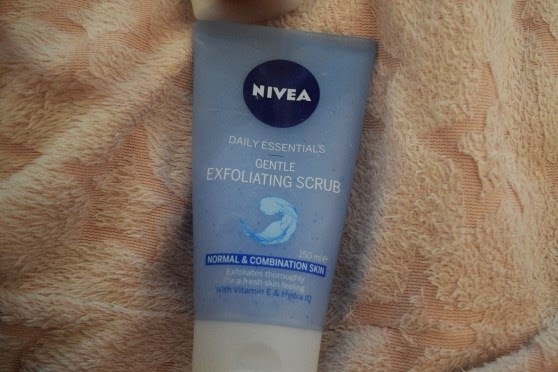 I normally follow my face wash with this scrub, again I use a teaspoon sized amount and rub around a slightly damp face (avoiding the eye area) and focusing on areas that have broken out. Again the packaging isn’t much to write home about but it is cheap and I love that you can see how much is left in it. After I have cleansed and exfoliated I use this very thick moisturiser. I only use it once a day, on a night. I don’t use a lot either, just a dab on the chin, nose, cheeks and forehead and then massage in. I have to say I love it. I wake up in the morning with a glowing complexion that isn’t too oily. My skin looks and feels hydrated. 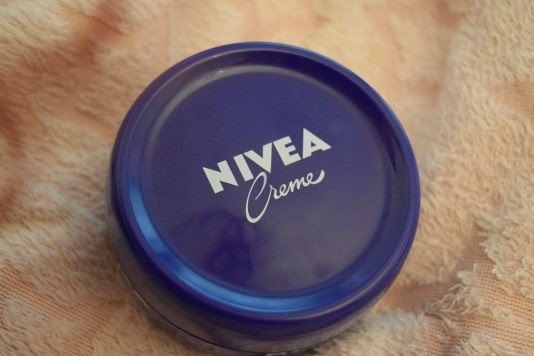 Since using this as my night cream I haven’t had to prime my face for foundation, I can just go ahead and slap it on. It’s brilliant. I have had this 200ml tub for 6 months and it looks like I have barely touched it! I can honestly say that these 3 products have turned my nightmare skin into something I could only dream for before. I am no longer dry on my cheeks, forehead and around my mouth and strangely enough I am no longer oily on my nose or chin. I would highly recommend trying these products out. They are so affordable and are highly nourishing.